"THE ONE AND ONLY CAR ROOF COVER THAT WILL KEEP YOUR RIDE PROTECTED FROM THE ELEMENTS"
Are you tired of manual car covers that are complicated and a waste time? Our Portable Umbrella Car Roof Cover is really easy to install. Designed with a folding structure, it is portable to make sure you can use it everywhere when you park your car. It’s an Automatic Car Tent, it’s a beach umbrella, it’s a fishing umbrella & LED camping tent! This umbrella cover will keep your ride protected from the elements. High quality for Maximum Security - Polyester blocking 99% UV light;Fiberglass holders features good toughness, not easy to break;Steel wire made anti-theft rope for maximum security. Use TPU rubber soft suction cups, strong suction, no shedding,which ensure the stability of the car umbrella during using and to avoid damage to paint. (in order to secure, sucker should be kept clean, and do not place in the seams). Strong Double Windproof Design - Designed with four windproof ropes with hook in the four corner ensured the stability of the car umbrella;The Half fixed connection between tent and ribs prevent the ribs from damage or bent in heavy windy weather, when the wind force reaches level 5, buttons will release automatically, tent and rib seperated. 99% UV Ray Reflect - Silver coated PU material, reduce interior temperature up to 25℃(45℉reduce interior temperature up to 25℃(45℉), keep you cool in car, emission reduction and fuel saving,prevent the car formaldehyde, benzene and other toxic gases volatile. Easy Operation & Portable - New and Semi-automatic folded car umbrella,8 seconds for opening, 30 seconds for installation.34.25in/87cm in length after folded up in a storage bag and 14.3lbs/6.5kg in weight, without any extra burden to your trunk. 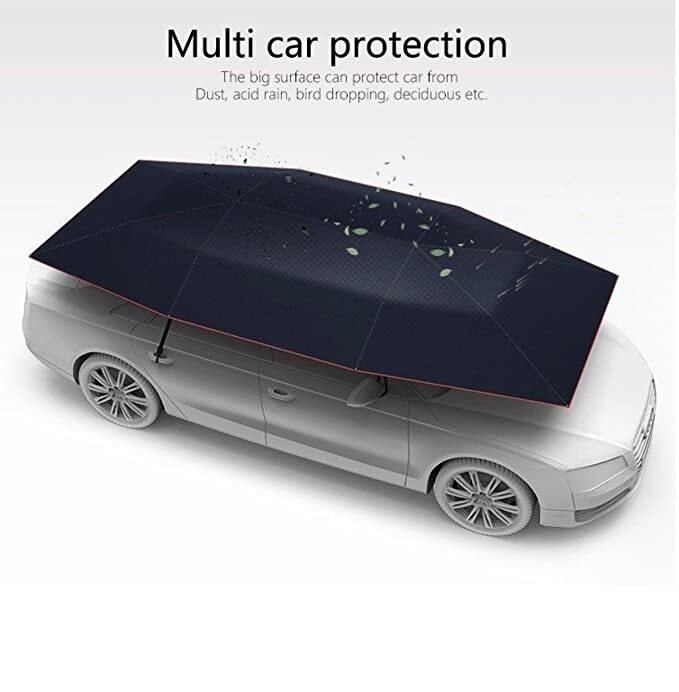 Multifuction Car Protection - Open size: W86.62*L157.48in (W2100*L4000mm),sunscreen air is ventilated between the tent and the car,blocking 99% UV light,reduce interior temperature.The big surface also can protect car from dust, acid rain, bird dropping, deciduous leaves etc.Windproof ropes is adjustable,you can adjust the length of windproof rope to suit different cars.You also can plus triangular bracket, suitable for outdoor barbecue, picnic, fishing and so on.